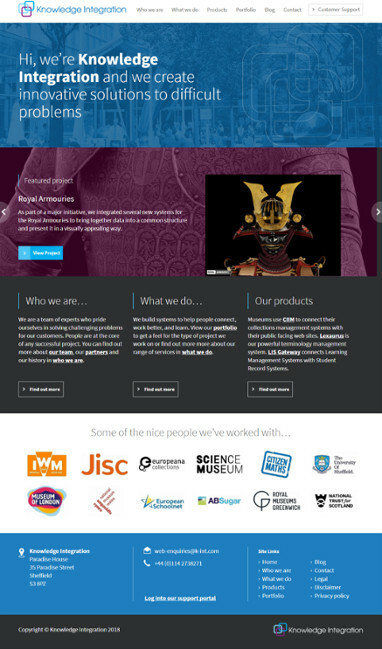 Knowledge Integration: Our new website is launched! Our new website has been a labour of love over the past few months and we’re pleased as punch with the result. We hope you like it too. We began by looking at our brand. Our customers were invited to tell us about their experiences of working with us and we embodied the prevalent themes into the redesign. The result is a fully responsive site built on the WordPress content management system. The WordPress build and theming was all completed in-house, with design input from the very talented Nik Gill at Nikpixels. If you have any suggestions for what you’d like to see on our site or any questions about the project please drop us a line.